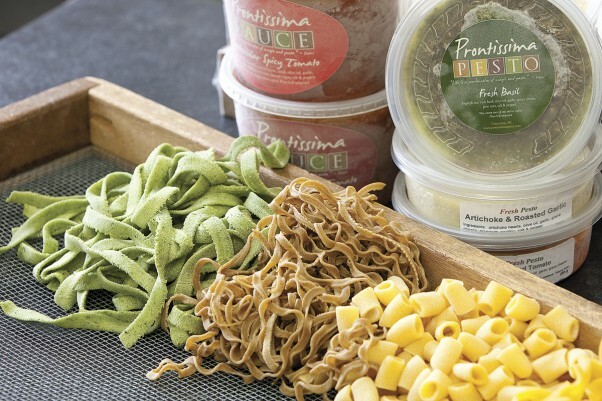 Prontissima Pasta offers gourmet cuisine ready in minutes. Long before it became trendy to “eat local,” farmers in the Comox Valley had been feeding area families and the local economy for more than a century. While some producers have remained committed to a particular farm product such as milk, beef, eggs or vegetables, others have—often out of necessity—diversified their operations. Shelter Point Farm and Distillery, located halfway between the Comox Valley and Campbell River, is a prime example. With the Oyster River bordering the farm to the south, and 2,000-metres of oceanfront on beautiful Oyster Beach and the Strait of Georgia to the east, Shelter Point is one of Canada’s few remaining oceanfront farms. For decades, this 405-hectare (1,000-acre) property was known as the University of British Columbia’s Oyster River Research Farm. In 2005, UBC made the decision to divest some of its collection of 14 different land titles that had been bequeathed to it in 1962 by New York stockbroker Barrett Montford. Marking the end of an era, the Oyster River operation was one of the properties that the University elected to put up for sale. Having spent his entire life in the Comox Valley, Patrick Evans was familiar with the farm and he and his family jumped at the chance to buy it. Evans is no stranger to farm life and he foresaw a great future for this land. Together with the support of his family and operations manager, James Marinus, a bold vision for a new type of farm was created. They dreamed of a property where wild areas, native animals, and birds would co-exist with humans and farming; where fish habitat and natural ecosystems would be restored and preserved; and where innovative value-added agriculture would allow for a financially viable farm for future generations… a production model with a sophisticated ‘farm gate’ retail side. A true testament to thinking outside the box, Evans and Marinus decided to focus on producing single malt Scotch, earning Shelter Point Distillery the distinction of being only the second of its kind in Canada! For Evans, a third generation farmer, this foresight comes naturally. He is a descendant of a family of visionary pioneers who had settled in the Comox Valley in the early 1900s. His great grandparents acquired land from the original Soldiers Settlement in the Tsolum River area and the family has operated Evansdale Dairy Farm for generations. It is interesting to note that, after close inspection of the original deeds following the family’s purchase of the farm, Patrick Evans discovered that his grandfather had once owned a quarter section of land encompassing a portion of this property. Marinus also brought a wealth of experience to the venture. He has been employed in the agricultural industry for almost 25 years, working with the Evans family on multiple key projects over the years. This experience, combined with a love for architecture and an eye for detail, would soon be evident in every facet of the Shelter Point Distillery’s development. First on the agenda for these ‘farm-preneurs’ was a new name. The idea to build a whiskey distillery at Shelter Point came about after several meetings with John Watson, executive director of the Comox Valley Economic Development Society. “Economic Development has a mandate to support agricultural diversification,” explains Marinus. “But farmers, in general, can get stagnant and complacent by focusing solely on what has worked in the past. We wanted to think well beyond the parameters of traditional farming operations and move from niche farming to a mixed operation that produced a product with a high return on investment. Shortly after the land purchase, Evans, his wife Kimm and their four daughters, and Marinus, along with his wife Pamela, two daughters and son, moved into two existing farmhouses on the property. The planning for the construction of a distillery and planting of crops began in earnest. Andrew Curry, a distiller from Scotland, and Jay Oddleifson, a chartered accountant and a consultant on several local development projects, were instrumental in the development of the project. Crop trials in 2006 produced a bumper crop and proved the viability of growing malting barley on site. Along with the special strain of barley, which will eventually provide the basic ingredient for the distillery, raspberries have also been planted for the fresh fruit market and potential use in other distilled spirits. Winter wheat and grasses are now sown in the fields, for the benefit of the many visiting waterfowl that overwinter on the farm. Some areas remain in forest, providing alternative habitat for resident species of wildlife, as well as a sustainable source of wood for future building projects on the farm. The architectural design for a distillery building that, according to Evans, is “reminiscent of an old dairy barn,” took years to perfect. 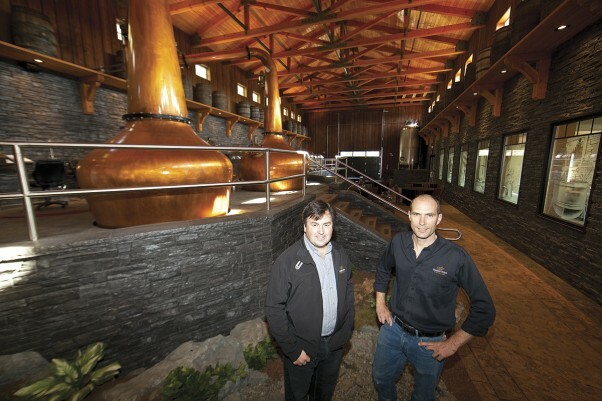 After three years of construction, the distillery was completed in December 2010. The towering, 7,500-square-foot building that now stands near the front of the property is sure to become a local landmark. While the building may have the outward appearance of a dairy barn, if cows were to be housed here it would be considered five-star bovine accommodation! The Shelter Point Distillery ‘barn’ is solid timber frame construction, built with lumber harvested from the property and accented with an abundance of stonework and a copper roof. Where possible, construction materials were sourced from Vancouver Island suppliers and skilled craftsmen from the Comox Valley—including father and son team, Chris and Kyle Henderson, and Hans Deneer—were contracted to do the work. About the only items in the building that aren’t local are the oak barrels, ordered from bourbon distillers in Kentucky, and the custom-made copper pot stills imported from Scotland. In addition to the all-important purpose of making whisky, the building has been designed to accommodate tours and special events. This past summer, the first year they have opened their doors to the public, more than 150 groups toured the facility and an average of 400 people were guided through the distillery every weekend. Visitors discovered meeting rooms and offices lavishly decorated with enormous leather chairs and wrought iron furnishings. The walls boast a collection of exquisite photographic art—all shot on the farm by local wildlife photographer Lee Simmons, whose work is also featured on the distillery’s website. 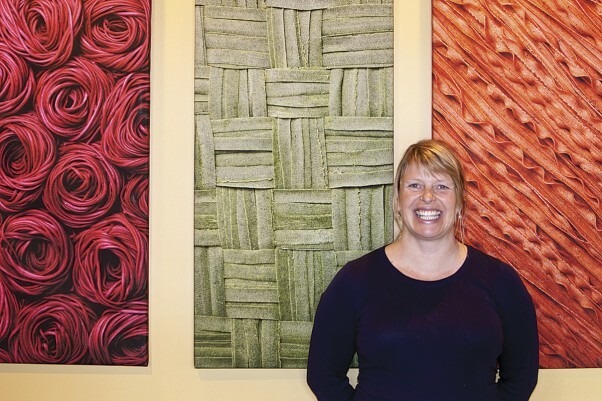 In the wall that separates the meeting/banquet room from the distillery area is a series of nine etched glass windows and a set of double doors that feature the work of local artist Robert Lundquist. The etched glass art walks you through the distilling process step-by-step; starting with barley in the field and ending with the founders raising glasses in a celebratory toast. As impressive as the building is, it is the immaculate distillery system that is most extraordinary. You enter though frosted glass doors to find a high vaulted ceiling under which two enormous copper pot stills and five copper and stainless steel fermentation tanks glisten under the bright lights. All are connected via a network of stainless steel tubing that runs behind the walls and under the floor to carry liquids in various stages of distillation from one tank to another. All of this is controlled by a state-of-the-art computer system. In July 2010, when they were ready to start their first batch of whisky, Mike Nicolson, a master distiller, joined the team to lend his expertise. The art of whisky distilling is very much in Nicolson’s blood. Both of his grandfathers were distillers on Islay, Scotland, and his father was a Lowland Grain Distiller. Scottish-born Nicolson himself learned the trade over three decades at some of Scotland’s finest Scotch distilleries. In 2003, he was recognized for lifetime industry achievement with a prestigious award from Whisky Magazine. What a fortunate co-incidence that he had semi-retired and relocated to Vancouver Island and was able to lend his expertise to the Shelter Point Distillery! As exciting as the whole process is for them, they will have to be patient before they see a finished product. In an age when technology changes at rapid pace, their focus is on slowing down to do everything right from the beginning. 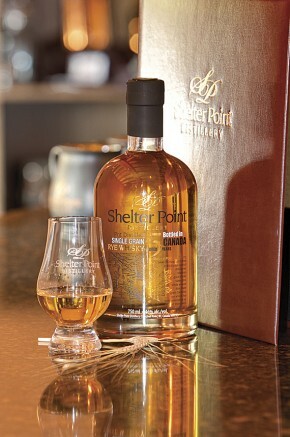 It will be August 2014 before they can make the premier release of Shelter Point Single Malt Whisky. The whisky-making process starts with up to one ton of barley being ground and mashed for five hours in a ‘Mash Tun,’ as up to 6,000-litres of hot water are filtered through it to extract the barley sugars from the grain. The spent grain that is created is then removed and transported to Evansdale Dairy Farm to be fed to the cows. The sugar water or ‘wort’ is then pumped into one of five 5,000-litre fermentation tanks. Yeast is added to the stainless steel tank to kick-start the fermentation process and, after five days ‘rest,’ it moves into the wash still where it is distilled for eight hours. After the distillation and vaporization process the liquid—now called ‘low wines’—is about 25 per cent alcohol. From there, the liquid is moved back into the spirit still where the magic of the final distillation process turns it to liquid gold—a product that can not yet be called ‘single malt whisky’ but is now more than 65 per cent alcohol. The liquid is then siphoned through a testing station where the ‘head, heart and tail’—or in layman’s terms, the beginning, middle and end—of the draw is monitored for alcohol strength. The ideal strength, explains Marinus, is about 63.5 per cent, which is generally at the ‘heart’ of the liquid stream. The ‘head and tail’ go back in spirit still to be re-distilled and the premium product is pumped into a holding tanking before it is poured into single use oak barrels to age for a minimum of three years, plus a day. That one ton of barley will ultimately produce about 900 750-ml bottles of single malt whisky. “That’s an amazing return on investment… if you can hold your breath long enough!” says Evans. While they wait for their first batches to come of age, Evans and Marinus are developing a range of other Vancouver Island spirits. In addition to the single malt whisky produced from 100 per cent malted barley, products in development include aged custom-blended whiskies and fruit and berry-infused spirits and cream liqueurs made from berries grown in their fields and fruit grown on local farms. When asked how they maintain their patience, having to wait several years before they can begin to bottle and sell Shelter Point Scotch, Evans smiles and says: “Playing the waiting game is what farmers do best! On a dairy farm you have to wait at least two years from the time a calf is born before she can produce milk. With berry crops you have to wait three to seven years before you get a decent harvest. Forests take 80 to 100 years. For more information visit: www.shelterpointdistillery.com.